How is soap made? It comes from the chemical reaction between the 2 basic soap ingredients which are animal or vegetable oils or fats (fatty acids) on the one hand, and caustic alkali (lye) that has been dissolved in water on the other hand. Caustic alkali refers to either sodium hydroxide (also known as caustic soda) or to potassium hydroxide (also known as potash). There are several processes for soap making, the most common being the cold process. To find out the details on how to make soap through the cold process, follow this link to Soap Making Technique. The fatty acids can be almost any oils coming from vegetable source (olive, coconut,…) or animal source (beef tallow, …). Preparing the lye is the most delicate operation in the process. It requires a good organisation, the use of safety equipment such as goggles, gloves, long sleeves shirt, and operating in a well-ventilated area. Indeed, mixing sodium hydroxide with water generates vapours which are quite noxious. However, the highest precaution is to never pour water onto the lye, as it would create projections of the mixture. Instead, always slowly pour lye into water, and use glass or stainless steel containers that can stand the heat. Different ingredients can be added for various purposes such as soap hardness or fragrance, which will give your homemade soap its absolute personal character. The liquid matter resulting from that chemical reaction between the 2 main soap ingredients is then poured in a soap mold which is conveniently made of flexible plastic. Soap molds can be of an infinite array of forms to suit your imagination. 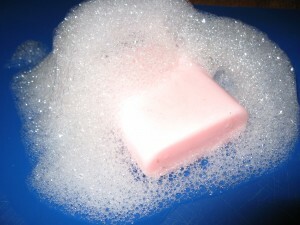 After 24 to 48 hours, during which it still emits noxious vapors and therefore must be stored in a well-ventilated area, soap is removed from the mold, possibly cut up in cakes. At that stage this handmade soap is still soft and is not yet suitable for use. It must be stored for around 1 month to get the required hardness before use. This introductory articles just tells you how easy handmade soap making is. To find out the details on how to make soap, follow this link to Soap Making Technique.